Singapore, 8 June 2010. Both times I dived in Miri, they were in some kind of a shroud. The first time, just after the Miri International Jazz Festival in May 2009, I dived a day after a typhoon had smacked into Southern Philippines which sits just out far east from this end of Sarawak. I recalled being amazed by the plentiful coral cover and anemones though the visibility couldn't go beyond 5m even with a prayer! 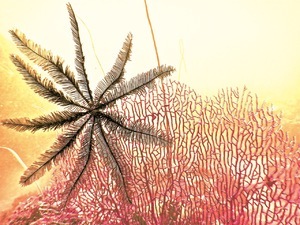 Feather star on a Gorgonian. Photo by Nick Coburn Phillips. Just last month, same time last year (following yet another enjoyable jazz festival), my buddy Nick Coburn Philips and I got into the boat on a clear day just after a day of thunderstorm, and dived in the same spots to somewhat better visibility all round ranging from 15m to 25m range. But what a delight it was! Miri diving is all about patch reefs with varying depths from 7 to 30 meters, so even novice divers can enjoy the numerous sites without having to go too deep. Best time to dive is apparently March to September, and the best of visibility can stretch up to 30 metres. But be prepared for heavy showers and storms at the tail end of the monsoon season. Miri's 40 dive sites never cease to amaze, even with repeat divers, who are either residents or workers in the thriving oil and gas industry (complete with several oil rigs), or pleasure seekers that drive down from Brunei. Popular sites include Anemone Reef; as the name suggests, the sea is awash with waving, soft anemones in various stages of retraction, protecting clown fishes in a mutually symbiotic relationship. Nemo may have found its home here for sure and made friends with the gay tomato clown fishes! You’ll be bound to be balled over by Eve’s Garden that according to Robert of Tropical Dives covers around 400 square metres of amazing hard and soft coral cover. We dived at the West end this time due to a slight current plying at the East end, which was supposed to be prettier. 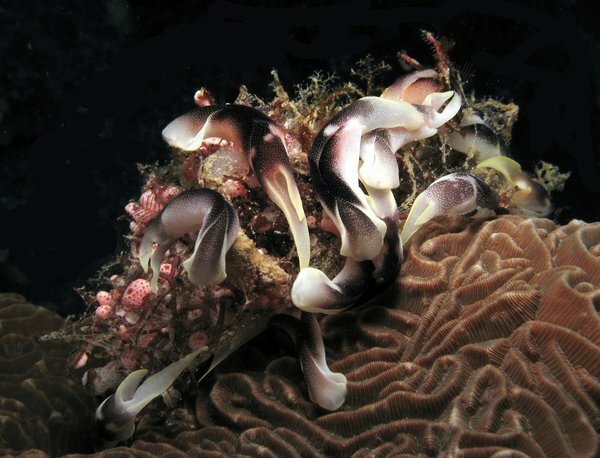 Hypselodoris Apoglegma Rhinophores. Photo by Luke Ho.But still, what a treat. A gorgeous site, Eve’s Garden tempts with her varied landscape of hard and soft corals, sea whips, sponges, giant clams, sponge barrels, and brainy looking squirts! Top marks for biodiversity here. 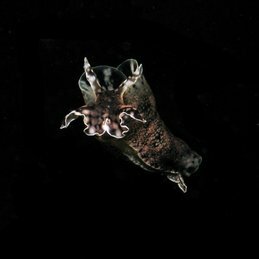 Two avid scuba divers from Singapore were also diving in Miri just days before we did, to satisfy their urge for photographing nudibranchs! Dr Luke Ho and Dr Mabel Fang, otherwise known as Dr Nudi, had previously dived there three years before. 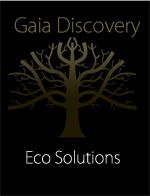 “Eve’s Garden is by far the best site for nudis. The diversity there is simply amazing,” said Luke. 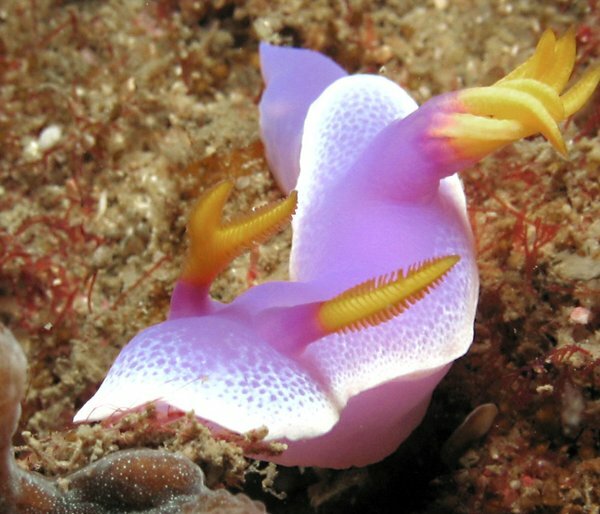 Apparently, 40 species of nudibranchs have been spotted in Miri. Nick discovered a gorgeous nudibranch called Berthella Martensi and we were amused by the markings on its body that we thought resembled a face. This was at Sunday Reef, where we also encountered the Sea Hare – a delightful swimmy slug that is known to wriggle its way up to the sea surface, then down again. The face of the Sea Hare. Photo by Luke Ho. No wonder Nick couldn’t take his lens off the wild scenes taking place underwater. I got bored (not much of a macro fan...yes, size matters!) and was totally distracted by what could have possibly been a hundred hovering squids at Sunday Reef. Their eyes bulged, checking me out. They were going nowhere. Neither was I. I think the fascination was mutual as I finned closer, and within three metres, I was held spellbound by their peace, beauty and grace. I shall never ever put a squid in my mouth! Reef fish, plentiful, kept us busy too. We glided among the angel fish, butterfly fish, a huge grouper, parrot fish, wrasses, tobies, gobies, and a juvenile scorpion fish. Our third dive on the second day got us a bit busy. A fishing net, what could have been at least 80m long, had caught itself around hard corals, rocks, anemones, and more. Robert figured it was a day old or so, and promptly ditched guiding us, to embark in the tricky task of removing it. I got into action. Chelidonura-Amoena getting cosy! Photo by Luke Ho. However, we had no dive knife with us, and it was difficult to dislodge the net completely, especially around the spiky staghorns. We secured the freeflowing bits but abandoned the removal of the whole net with the intention of Robert and more divers returning again with knives and cutters. At least we rescued some anemones and critters from becoming trapped and possibly, killed. Back on the boat, heading back to shore, we discussed the net. Robert was surprised to see such a long net when there were hardly fishing boats near the coast of Miri and around the popular dive sites. He was baffled. But last year, we both removed long fishing lines that were entangled around a coral table during one of our dives here as well. An unlucky coincidence? Educating fishermen on safe fishing methods would be a good thing, plus where not to fish as it would affect tourism in the long run to fish at popular dive sites, knowing that one bad move or two can wreck havoc on the biodiversity that has been preserved so well over the years. I made a mental note to go out and get myself a dive knife as all too often, when I go on leisure dives, I end up being a rescuer or sea gardener. I also made a note to dive, the next time when I am in Miri, the two famed wrecks: the Atago Maru Wreck, a 300 footer ruin from the Second World War (home to giant grouper, large trevally and barracudas I hear), and the Sri Gadong Wreck, a 100 foot cargo ship that teams with fish. In better visibility conditions, I hope. Photography by Luke Ho and Nick Coburn Phillips. Video by Nick as well. With thanks to Sarawak Tourism Board, Park City Everly Hotel, Tropical Dives (scuba diving division of Planet Borneo Tour & Travel Services) and Malaysian Airlines for making this trip possible.